Week 5 of the #oneroomchallenge of my Master Bath Remodel! Week 5 was filled with MORE PROGRESS!! AND TODAY WE HAVE A WORKING BATHROOM!!! If that didn't put a lot of pressure on you... it did on me!! !We are finishing up installs today. Tonight is touch-up paint, Tomorrow is cleaning and staging for the photoshoot on Friday!!! ...But let's back up - what did it take this week to get us to this point? But again, this remodel was a huge TEAM effort. The team I had working on our bathroom is AMAZING. And Ben and I could not be more happy! Let's review this weeks AMAZING PROGRESS!!! Week 4 was filled with PROGRESS!! WE ARE IN WEEK 4 OF #ONEROOMCHALLENGE of my master bathroom remodel #cartermasterbathremodel ...If you have been following me along on Instagram andFacebook stories my bathroom is finally getting some beautiful FINISHES INSTALLED!! Walls are closed, tile is almost complete- SO MUCH HAS HAPPENED THIS WEEK!!! I've been excited every morning to wake up EXTRA EARLY and have people in our house making progress (well some mornings) haha. This week has been exciting to see some great progress, but (I'm not going to lie) its also been tough. Tough on me and my husband, Ben. Ben is in the restaurant business and works late, so having to wake up super early everyday or be woken up by the sound of a tile saw is rough. Not to mention we are not sleeping in our own bed- we are down the hall in the guest room. THERE IS NOTHING LIKE YOUR OWN BED...He's a trooper. I see the light at the end of the tunnel- I mean we literally only have less than TWO WEEKS LEFT to show you the final bathroom!!! Thats nuts! When I look at the progress of this week it look like we are so close, but we have a TON LEFT TO DO in this short amount of time! Let's review this weeks AMAZING PROGRESS. Week 3 was here and now gone like that!! Week two was all about LABOR, PLANNING, TRACKING ORDERS, ETC. This week (week 3) the LABOR IS STILL UNDERWAY!!! We had Parrish Hot Mop here!! They are the best around and so thorough! Although the drain is not in the exact location I wanted, due to many reasons that come up on a jobsite, it will be a deluxe detail that will not be overlooked! What's the number one finish that BUYERS LOOK FOR in a new home?! You guessed it! Hardwood flooring!! Good quality hardwood it a huge selling point for a house. It appeals to buyers for so many reasons! Not only is the look visually appealing, but it is also durable, feels amazing under your feet, brings warmth to the home, and is easy to clean. There are so many options out there with wood flooring- from the species, the stain, the thickness, the width, and the pattern in which you install! One of my current favorite species is a white oak! It has light uniform gaining and minimal variation for a cleaner more classic look without the red tones! One of the biggest factors in selecting flooring is stain color. Every manufacture's stains are slightly different. And every stain looks different on each species of wood! Try staying away from yellow and red tones- wood is warm enough of a tone on its own! You will be surprised to see how gorgeous it can look when you don't try to change the natural tones with a stain (like a grey stained floor is super trendy right now- stay away!)... Go for a light stain that will highlight the natural tones in the wood. If you want something unique- mix stain colors to create patterns in your floor (great for entry or kitchen floors). Another way to add some uniqueness is to install in a pattern! Lay it out in a classic herringbone pattern, chevron, or diamond pattern- get creative!!!. Another option is to paint your flooring. Painted wood flooring is making a comeback in modern farmhouses! I've shared all kinds of ideas for you below and some of my favorite wood flooring looks! I hope they INSPIRE you to update your flooring! Happy Monday!!! Bathtubs that steal the show!!! Its Fall- time to soak as the nights start to get chilly!!! Having a place to relax is a MUST. Everyone has busy lives these days and it is so important for us all to find relaxation every once in a while :-)... I LOVE a good soaking tub! Mixed with my favorite bath bomb or pink grapefruit salt scrub from our local #midnightkin shop on Main St. And what a great time to talk soaking- because just yesterday I was given the ok by my back surgeon to take a bath! or swim! or hot tub!!! For those of you who didn't know I had back surgery 6 weeks ago... and it takes a long time to recover. So hearing this news inspired me to talk baths! Master bathrooms especially deserve a luxurious tub! The addition of a tub in your en suite will not only increase the resale value of your home, but it can also be a great focal point in the space! There are so many different styles of tubs to chose from. If you like an organic freestanding shape that makes a huge impact on style! Or maybe you prefer a built-in tub with extra space to surround yourself with candles or a glass of wine! Tubs also come in a variety of materials- there are so many more options than a heavy white cast iron tub! See some of my favorite bath styles below!! Thinking of ways to update your home before putting it on the market?! When a potential buyer pulls up to your house, curb appeal is everything!! As a seller, you want your home to appeal to a wide range of buyers by having your house look up to date and maintained. Wouldn't you want them to be impressed and excited as a first impression, rather than already making mental notes of what to change? One of the easiest things to update your curb appeal is replace your garage door. Switching out the mundane factory quality doors that get installed in most homes, to an updated style will elevate the exterior of your home instantly! It will make your house stand out as unique and show that you put effort in keeping your home current and well kept! I've put together my TOP Favorite garage door images below to INSPIRE you to make the switch! Hope you enjoy!!! If you haven't heard about what Vegas Market is, it is a designers only trade show for furniture and accessories. Its a great place to go to get inspired by new product launches, and also to be able to see many of the product lines we regularly shop online in person! When at market we want to make sure that we find the latest and greatest trends so that we can come back to the design studio refreshed and ready to tackle new projects with a fresh eye! This years Vegas Market was full of some amazing finds! 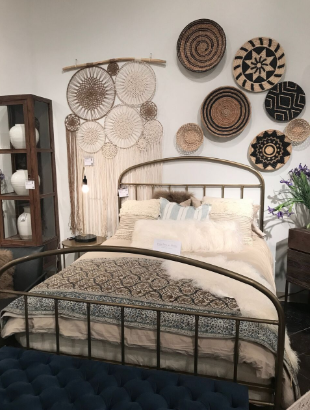 Throughout the different showrooms there was definitely a theme of natural fibers such as jute and rattan, as well as a lot of textured accessories and colorful accents. These elements can be incorporated in many ways! For some that really love bold color, an upholstered sofa may be the way to go! For others that want to be a bit more subtle, try adding a bight accent chair or a vintage rug! Bring natural fibers into your space by hanging a few jute pendants over your kitchen island or adding a fun rattan accent table! Don't forget about accessorizing! There are so many great pillows and throw blanks that have a variety of textures and colors that make the perfect finishing touch to a sofa, accent chair, or bed! Don't forget that Molly Erin Designs offers a buying service for anyone that isn't in need of full service design help! Give us a call if anything catches your eye when scrolling through some stunning finds from Market! Are you thinking of putting your home on the market?! If you are, it's important that potential buyers feel comfortable and can envision themselves living there. Take advantage during open houses and showings!! What says I take care of my surroundings like someone who can keep house plants alive! I know I struggle with this sometimes and am always amazed when I walk into a home that has real live plants thriving! If someone has been attentive to their plants and cares about keeping them looking nice, I can almost guarantee that they also pay attention to their home and keep it looking nice too! With that being said there are a lot of stylish ways to add greenery in your home! Hangingplants is a great option if you love boho style and have your eye on those amazing macrame plant hangers that are in right now, or have limited space. For larger plants, try putting them in a woven basket! This will not only act as a stylish substitute for a pot, but also will add additional texture and warmth to your space . Another option that we have been seeing a lot of lately is to use plant stands! There some amazing options in stores these days! With that being said, I wanted to share with you some of my FAVORITE ways to style your house plants, to make it feel like an indoor oasis! Black and white exterior paint is HOT!! Not only are these colors in trend, but they are alsoclassic! Black and white is very minimalist but at the same time can really make a statement. There is just something about the contrast of the two colors that balance and compliment each other so well. Not to mention how they can highlight your homes architecture by making the small details really POP and let the landscape stand out! These colors can be incorporated into your exterior in a variety of ways and on all styles of homes! For farmhouses, all white with black trim and shutters is super chic. When designing the exterior of a mid century or ultra modern home, color blocking is more common by painting the bold architectural elements to highlight them. Mediterranean homes are also in the mix by doing a classic white stucco and incorporating the black in the trim and iron work. Don't leave out the cute cottages either, with their crisp painted siding and contrasting trim! 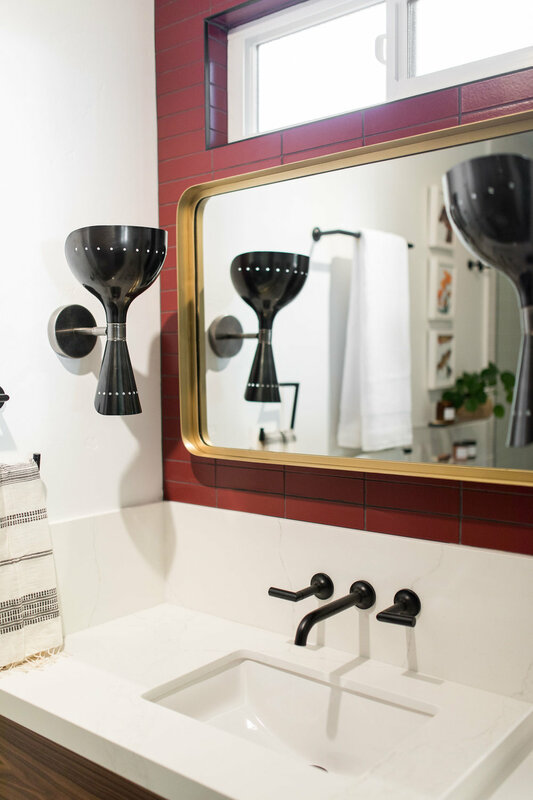 If you are ready to go super bold with your color choice, try painting your homemonochromatic and sticking with solid black! My favorite it a modern cabin for the woods! Having the trim and siding all one color is a fun modern twist that we are seeing pop up on all different styles of homes! Below are some stunning homes that perfectly execute the trend to get you INSPIRED! Be sure to let us know in the comments below what style home you have, and how you would choose to highlight it by incorporating black and white! The benefit of having a POOL when listing your home for sale! Summer is here and if you are looking to sell your home with a pool now is the perfect time! Have you ever driven past a for sale sign that says "pool" at the bottom and felt urged to stop and grab a flyer?!? Having a pool on the property will increase the equity of you home and also increase buyers interest when putting your home on the market. Lately the younger generations are starting a trend in becoming early homeowners! As exciting as that is, it means that buyers are looking for different things when searching for a home. One of the main bonuses buyers are looking for is a swimming pool! Having a pool is appealing to young buyers for a variety of reasons. One of the biggest being the social aspect. I know from experience, one of the best things about having a pool is being able to have get together's on summer nights and to relax and work by the pool in the afternoons... I mean who wouldn't want to join in on the relief from the scorching California heat?!? Am I right?! With that being said, I wanted to share with you some of my favorite styles of pools to get you excited for summer and INSPIRE you! Maybe its time to put one in!! How to Style the perfect BAR CART!!! Bar carts are a timeless piece that bring an extra bit of style to every home! Not only are they useful for entertaining by providing the perfect place for mixing drinks, but there are also endless opportunities to dress up your bar cart to add flair to your parties! A perfectly styled bar cart is when function and form are effortlessly combined. Its important that you have all of the essentials for making your guest their favorite drinks, while still having it look beautiful! So, how can this be done?!? Start with your favorite alcohols and only your best glasses to keep things from getting too cluttered. From there you can style your bar cart with accessories to suit your home! If you love metals, add in a fun brass or copper shaker with a matching ice bucket! Or if you want a glam bar cart add a crystal decanter! For me, what makes a bar cart really stand out is the small details! I love using trays under my wine bottles or glasses to add a bit of contrast. Pretty detailed coasters and stirring spoons are also a nice touch! Don't forget the flowers and personal touches! A small and simple bouquet of flowers is an easy way to make your bar cart feel festive while adding a touch of elegance! Placing other small items on display such as monogrammed whiskey glasses or your favorite cocktail recipe book is a great way to add your own personal touch! Below are some of my favorite bar carts to get you inspired! CHEERS!! Incorporating Boho Style In Your Home! What sticks out to you when you see a boho inspired space? For me... its the variety of fun textures! Light wood tones, fur, and patterned fabrics, all combined with one of a kindfurnishings and LOTS of real plants! Lately I have been inspired by all the uniqueness that these boho spaces have to offer. I can't get enough of the bold colors, and the natural elements, all seamlessly blended together! You can easily incorporate this fun style into your space and get that boho vibe by adding just a few of these elements in your home! To get you inspired I decided to share images of some of my favorite bohemian spaces, and new boho inspired products for the home! Hope you enjoy! Everyone who knows me knows I LOVE flowers! They make me soooo happy! And this time of year I am inspired by them! When you think of design do you think of florals? Or do you get flash backs of your grandmas floral wallpaper :-) If I had a dollar for all the times I've heard clients say that :-) Well... Florals are IN and and making a HOT come back in design! Each time I shop for a client, or flip through a design magazine I see a new beautiful floral patterned POP that makes me fall deeper into floral LOVE. So with spring in the air (my favorite time of the year for flowers) I've decided to share with you a few of my favorite new products for the home inspired by florals! Hope you enjoy! I LOVE nice doors! Who's with me??? Have you ever been in a home with hollow core interior doors? You knock on them and feel like your fist could break right through...and you can hear everything going on on the other side... Yuck! What a difference it makes in a home to upgrade to solid doors and nice hardware! ...And its not that hard to do! The feeling you get when grab hold of quality creates a whole different experience. Add value to your home and make the switch! And the fun part is selecting the style that speaks to you! There are so many fabulous door styles to choose from. I've selected a few of my favorites below... Which style do you prefer? Thank you for a FANTASTIC 2016!!! I wanted to take the time to THANK each and everyone of YOU that has supported MOLLY ERIN DESIGNS in 2016. It has been a amazing year! Whether you were a client who trusted me in the FULL DESIGN and REMODEL of your home, you sent me a REFERRAL, you are a talented professional that was PATIENT with me (when I wanted to make sure ALL the details turned out perfectly :-)), you may have been a vendor that gave me EXCEPTIONAL customer service, or you may have sent me ENCOURAGEMENT throughout the year... your SUPPORT paid off and I truly APPRECIATE you!!! Everyday and every design project is different- I learn something new on every jobsite, with every client, and with every trade involved. This year I've had the opportunity to design and implement a version of almost every style out there- modern, rustic, farmhouse, mediterranean, contemporary, traditional, southwestern, mid century, industrial, etc. Thanks for keeping me on my toes! ... I LOVE my job. And without your support, Molly Erin Designs would not be happily celebrating its 6th successful year in business!!! I WISH you all a HAPPY and HEALTHY New Year!!! Cheers! LIGHTING is such an important part of GREAT DESIGN. Apart from the necessary task lighting we all need to get things done, there should also be some fixtures layered into your design that speak to YOUR style. Have fun with lighting! Why not make a statement! There are so many amazing light fixtures to choose from. I selected a few of my favorite fixtures available below... Which style do you prefer? Thanksgiving table settings that are sure to amaze!!! Thanksgiving table settings that amaze!! With Thanksgiving right around the corner, its time to start planning how you are going to make your table setting special this year...What style have you been inspired by? We have GATHERED our some of our favorites below. Get inspired and share your style with your family and friends this holiday season! Hope you enjoy!